Christine M. Ellie, DPM, is the podiatric foot and ankle surgeon at New York Bone & Joint Specialists, with NYC offices in the Upper East Side, Murray Hill, and Midtown West neighborhoods of Manhattan, and in Hoboken, New Jersey. Specializing in sports medicine, bunion surgery, and reconstructive foot and ankle surgery, she’s treated hundreds of athletes at every level of competition for a variety of injuries, from plantar fasciitis to stress fractures. Dr. Ellie strongly believes in the value of an effective rehabilitation plan. With her extensive knowledge of sports medicine, she can quickly pinpoint an athlete’s structural weaknesses, recommend options for surgical intervention, and develop a physical therapy program designed to strengthen and protect the feet and ankles from future injury. In the process, she shortens her patients’ recovery timelines and minimizes any lasting impact on their athletic performance, helping them to return to their active lifestyles without impediment. Dr. Ellie is an Attending Surgeon at Northwell/Lenox Hill Hospital. She is also affiliated with Midtown Surgery Center and Surgicare of Manhattan. 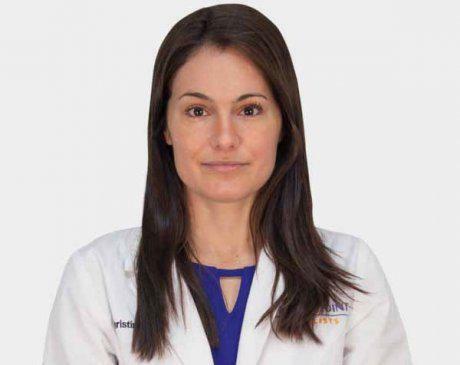 After graduating from the University of Pennsylvania and the New York College of Podiatric Medicine, she served as a Resident in Podiatric Medicine and Surgery at New York-Presbyterian/Lower Manhattan Hospital from 2008 to 2011. She received her license to practice in New York in 2011, and her certification from the American Board of Foot and Ankle Surgery in 2013.